All signs are pointing towards a really depressing economy but as bad as it may get, the kids still need fun stuff to do! Which is where we come in, we promise you that NY remains a great place with kids and there are loads of great free activities so please don't go running now that the stock market is tanking. Stick with us and we will keep churning out great ideas on how to spend your days where all you need is a metro card and some PB&J's in your bag. For great free fun on a nice day, head to Long Island City's Socrates Sculpture Park, which just launched it's 2008 Emerging Artist Fellowship Exhibition. In addition to being a beautiful spot for a picnic, the Emerging Artist show is filled with cool art that is very appealing to kids of all ages. Take, for example, the piece in the photo above which is a mechanical door that opens and closes by artists Kim Beck & Osman Khan. I went with a gaggle of toddlers and they were entertained by this exhibit for at least an hour and only left cause we dragged them away. (Don't worry, it senses when little bodies are in between so no chance of stuck fingers). Also not to be missed is Juniper Perlis' exquisitely beautiful steel tree which is the exact replica of a tree right next to it. Spend some quiet time examining the trees and matching bends in the branches. September 20: Treasure Hunters and Gatherers with Macrae Semans. Junior artists examine everyday objects and materials and create individual mixed media sculptures. Participants are invited to bring objects - found, personal, natural or bought - to add to their project. September 27: My Reusable Canvas Bag with Katherine Novick. Be environmentally friendly and design a tote bag with your own original print. Participants will use the Park as inspiration to create a block print that will be applied to a reusable canvas bag. Sundays, through October 12 (weather permitting): Boating in Hallets Cove. In partnership with Long Island City Community Boathouse (LICCB) and Partnerships for Parks, Socrates hosts free boating in Hallets Cove run by the LICCB. Participants are invited to kayak and canoe from Socrates Sculpture Park's beach. An adult must accompany participants under 18 years of age. For tide schedule and more information, check out LICCB’s website, www.licboathouse.org or call 718. 228.9214 to reach the hotline. 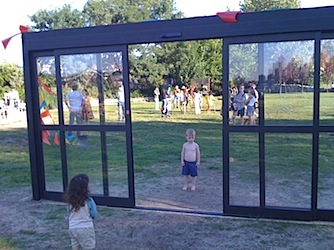 The Socrates Sculpture Park is always FREE and open 365 days a year from 10am to sunset and is located at the intersection of Broadway and Vernon Boulevard in Long Island City. By Subway take the N or W train to Broadway (Queens), walk 8 blocks west on Broadway to the intersection of Vernon Boulevard. For driving directions, visit their web site at www.socratessculpturepark.org. * Depression Specials: Costco is right next door and even if you don't have a membership there is a seriously cheap hot dog / ice cream type snack bar and a well priced wine and liquor store that require no card. Also, the Noguchi Museum is across the street and partially closed for renovations now. Head in and act disappointed and they will give you free passes for when they re-open!